Pioneers in the industry, we offer lead smelting rotary furnace and rotary furnace from India. 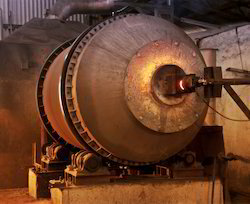 Counted as first among the best, we provide clients with the superior quality of Lead Smelting Rotary Furnace. Used in manufacturing process of molecular sieve and catalytic agents, the offered lead smelting rotary furnace is precisely engineered by using ultra-modern technology. Ability to tolerate adverse weathering conditions, high performance and low maintenance, make the lead smelting rotary furnace highly demanded. cement clinker. Also, it is applied to calcine pellets and powder or dry raw materials in the refractory and ceramic industry. In the chemical industry, it is widely used for drying, dewatering, and calcining raw materials. The rotary furnace is designed for treatment and recovery of Lead from Lead Acid Batteries Scrap and for the reduction of Lead Sulphate, Lead Oxides, Lead Concentrates, Lead Dross and Lead Ore. Rotary Furnace will work at a temperature of about 1000-1200 C. The Inside Temperature Indicator is provided on the electric control panel and the Thermocouple probe at exhaust duct of the Rotary Furnace for controlling & maintaining the temperature in the furnace. The recovery of Lead is more as compared to Blast/Fixed Furnace. This system is environmentally friendly. User-friendly with less manpower requirement due to less manual work. Looking for Rotary Furnace & Kiln ?